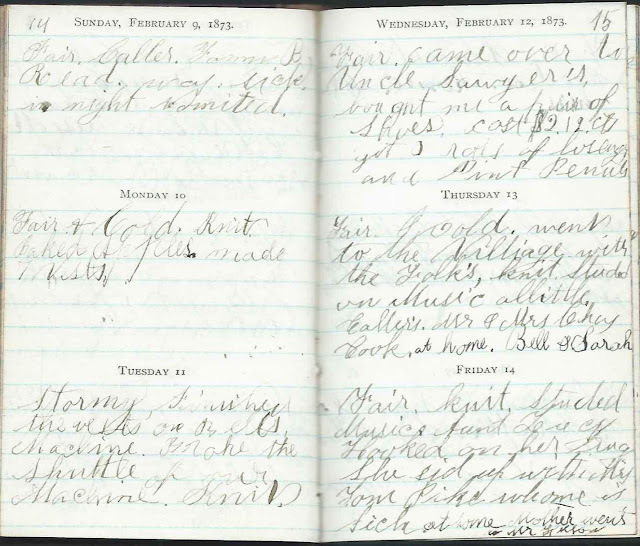 February entries in the 1873 diary of Ida Isadore Reynolds (1860-1946) of Acton, Maine. Ida would marry John Jotham Shapleigh (1856-1923) in 1881. Links to the previous month of January 1873 and succeeding month of March 1873 appear here and at the end of this post. Tuesday, January 28, 1873: Fair. Hands are better. Went to Hattie's. Caller: Jacob Stevens. Ironed. Everett went to [George's or Georgie's]. Finished my dress. Got a box of salt by Enoch Sherman. 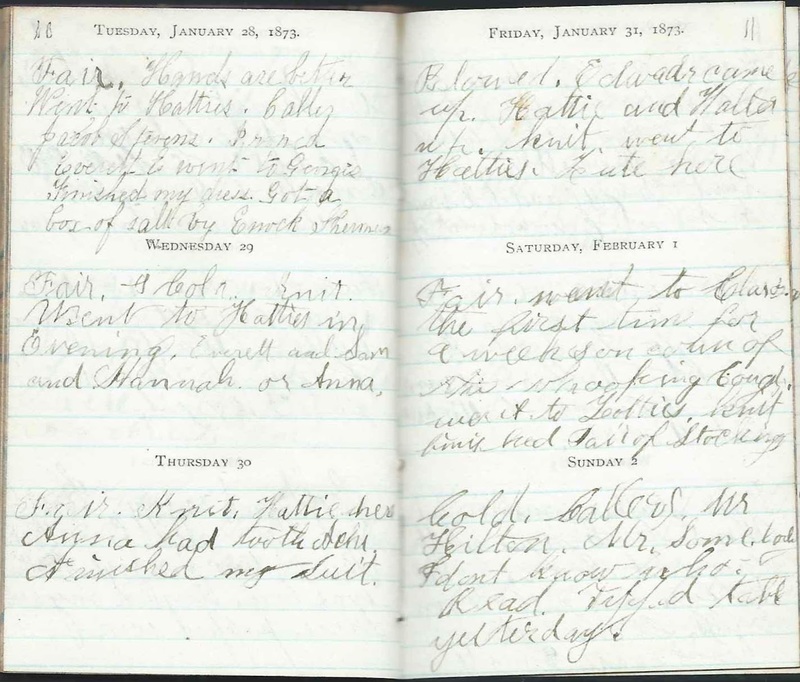 Wednesday, January 29, 1873: Fair & Cold. Knit. went to Hattie's in Evening. Everett and Sam and Hannah or Anna. Thursday, January 30, 1873: Fair. Knit. Hattie here. Anna had tooth ache. Finished my suit. Friday, January 31, 1873: Blowed. Edward came up. Hattie and Walter up. Knit. Went to Hattie's. Lute here. of the whooping cough. Went to Hattie's. Knit. Finished Pair of Stockings. [ ? table ?] yesterday. Monday, February 3, 1873: Fair. Dr. Parker came up and pulled my tooth and Hannah's. Did not Holler. Everett went to Aunt Lucy's and to Library to School. Edward went off. Tuesday, February 4, 1873: Fair. Father went to the Falls in night. Went to Hattie's all night. Mother and __ went to Enoch's. Hattie here. Made 4 vests. Wednesday, February 5, 1873: Fair. Father ___ home. Went to George with Sam and Anna. Rolled taffy and had gumballs. ___ made vests. Thursday, February 6, 1873: Fair. made 6 vests. Got a letter from Everett and from Aunt Lucy. Callers: Eliza Prescott, Hattie. George Sherman. Knit. Slid. Father went to the Falls. Sunday, February 9, 1873: Fair. Caller: Fannie B. Read. Was sick in night. Vomited. 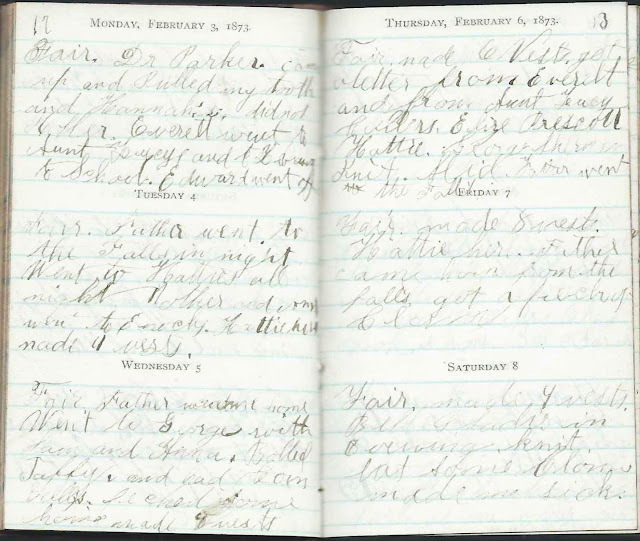 Monday, February 10, 1873: Fair & Cold. Knit. Baked Apples. Made 7 vests. husband Rev. Seth Sawyer (1808-1892) of Milton Mills, New Hampshire. cost $2.23 cts. Got _ rolls of lozenges and Pint Peanuts. 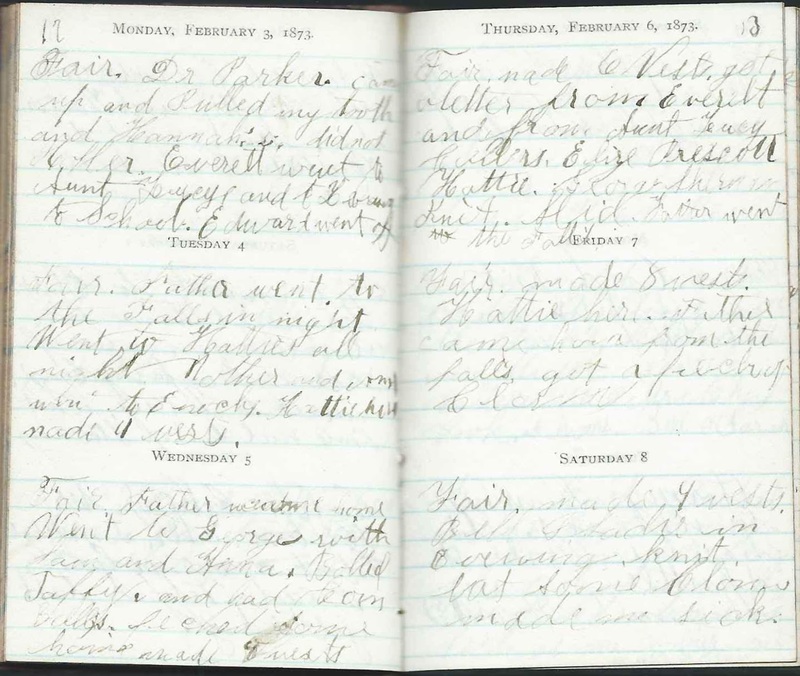 Thursday, February 13, 1873: Fair & Cold. Went to the Village with the Folks. Knit. Studied on Music a little. Callers: Mr. & Mrs. Charles Cook. at home. Bell & Sarah. with Mrs. Tom Pike who is sick at home. Mother went to Mr. Hilton's. Saturday, February 15, 1873: Fair. Studied Music. Read. at home. Clara here. Sunday, February 16, 1873: Snowy. Went to Mr. P? [Penney, Perry ? ]to Mrs. Brown's Funeral. Callers here. Mr. Whit? [Whitcomb ? ], Mr. Horn. it was "I am going home". Churned. Tuesday, February 18, 1873: Fair. Washed. Studied Music. Read. 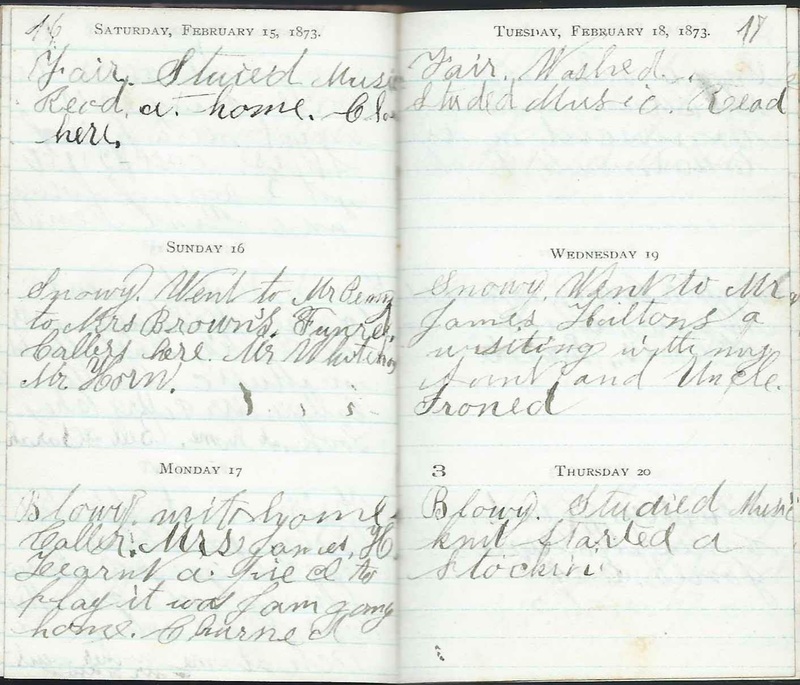 Thursday, February 20, 1873: Blowy. Studied Music. Knit. Started a Stocking. 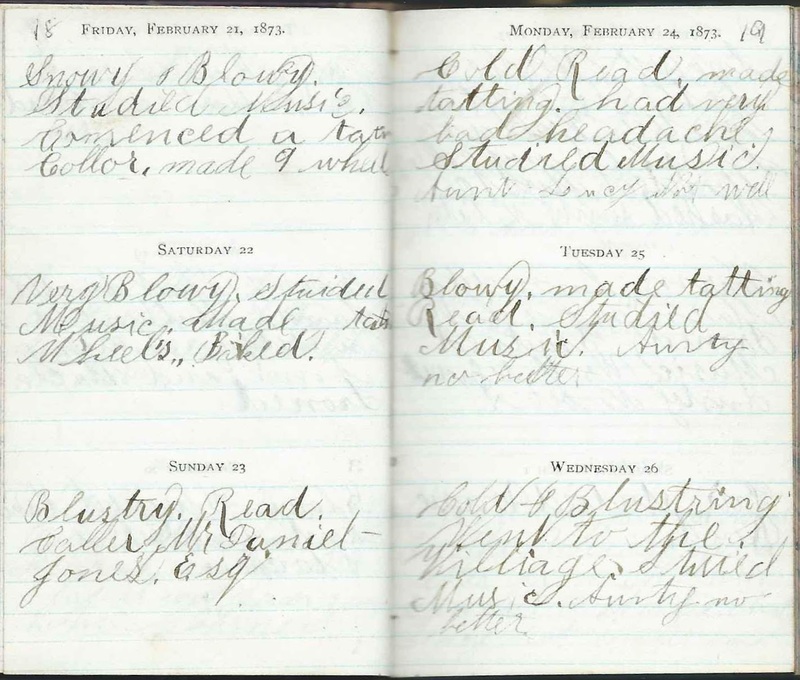 Saturday, February 22, 1873: Very Blowy. Studied Music. Made tats Wheels. Baked. Sunday, February 23, 1873: Blustery. Read. Caller, Mr. Daniel Jones, Esq. 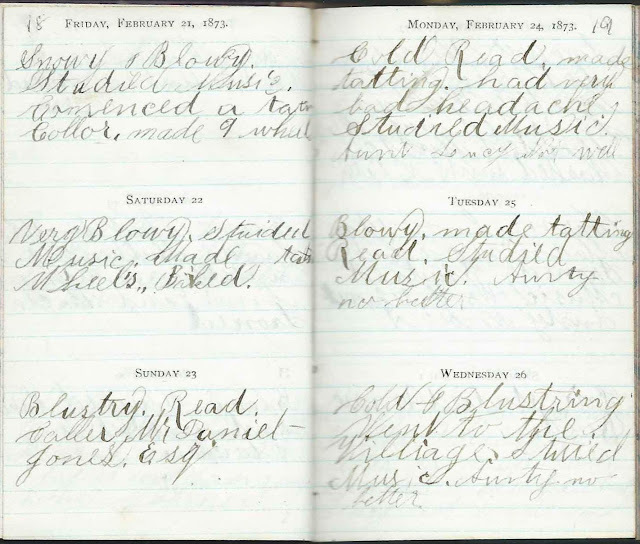 Monday, February 24, 1873: Cold. Read. Made tatting. Had very bad headache. Studied Music. Tuesday, February 25, 1873: Blowy. Made tatting. Read. Studied Music. 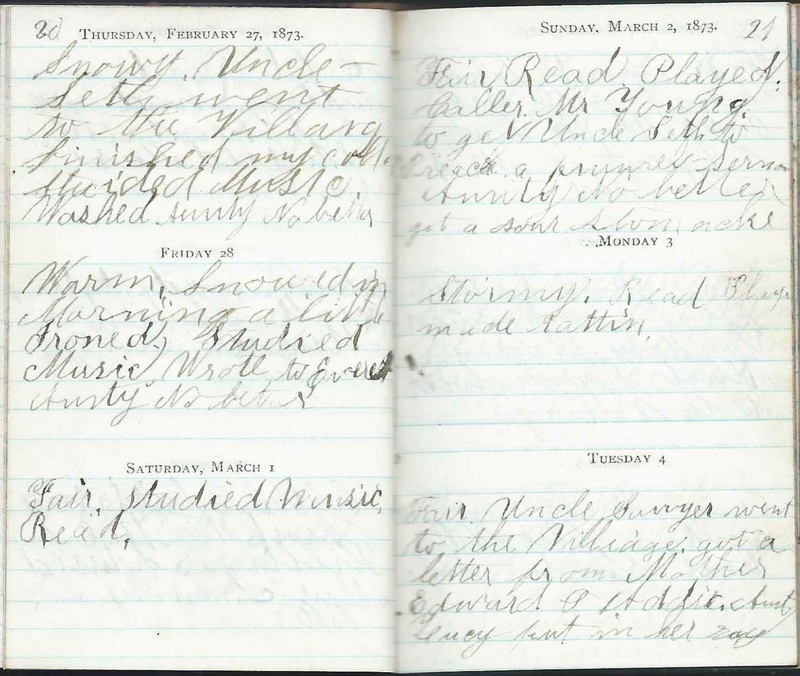 Aunty no better.Wednesday, February 26, 1873: Cold & Blustering. Went to the Village. Studied Music. 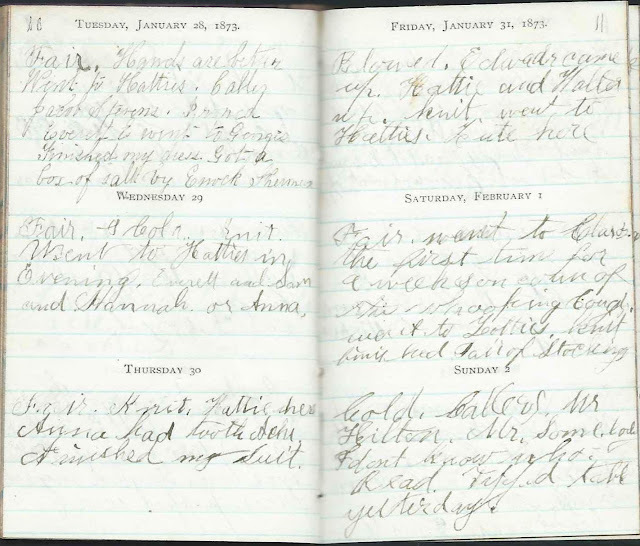 Thursday, February 27, 1873: Snowy. Uncle Seth went to the Village. Finished my collar. Studied Music. Washed. Aunty no better. funeral sermon. Aunty no better. got a sour stomach. 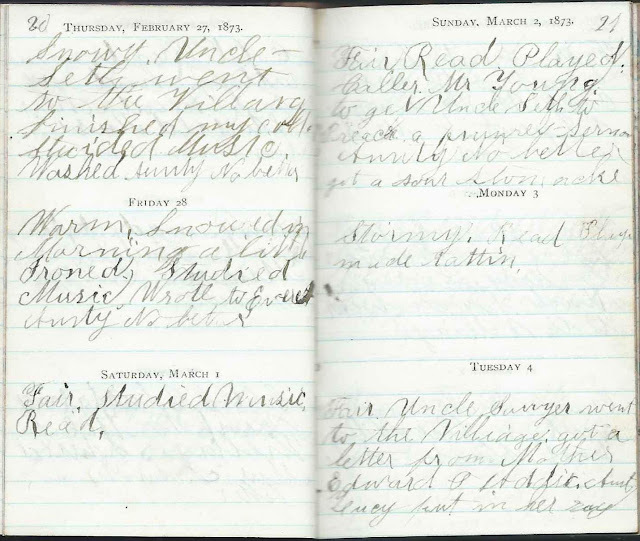 Tuesday, March 4, 1873: Fair. Uncle Sawyer went to the Village, got a letter from Mother. Edward & Addie. Aunt Lucy put in her rug. People mentioned, in order; first time only. Readers are requested to fill in the blanks. George or Georgie - presumably either George A. Sherman (1860-), son of Enoch Piper Sherman (1836-1922) and first wife Jane (Guptill) Sherman (1832-1861) or Georgia A. Hilton (1864-1926), daughter of Andrew F. Hilton (1836-1894) and Emeline A. (Hersom) Hilton (1838-1884), "Emma"
Hannah Francis (1854-1923), daughter of Dr. Daniel Francis (1810-1867)and Christie Ann (Tupper) Francis (-1893), who was a sister to Ida's mother Rachel E. (Tupper) Reynolds (1833-1923); also known as Annie; she would marry James Alexander Buchanan. Walter Herbert Sherman (1856-1888), son of Thomas Sherman (1823-1893) and Abigail Elizabeth (Fox) Sherman (1822-1877) and sister of Ida's friend Harriet Eldora Sherman (1859-1937), "Hattie"
Mr. Hilton - presumably Andrew Hilton (1810-1873), husband of Eliza Ann (Paul) Hilton (1816-1891); Andrew would die in December of 1873 while traveling to Middleton, New Hampshire, where his brother James Hilton (1806-1873) had just died. Dr. Parker - presumably John Selden Parker (1824-1910), presumably the Dr. Parker mentioned in the entry of Monday, February 3, 1873, as having pulled Ida's tooth. Ida "Did not Holler"
James Hilton (1806-1873), husband of Adeline E. P. (Davis) Hilton (1822-1907) and brother of Andrew Hilton (1810-1873). 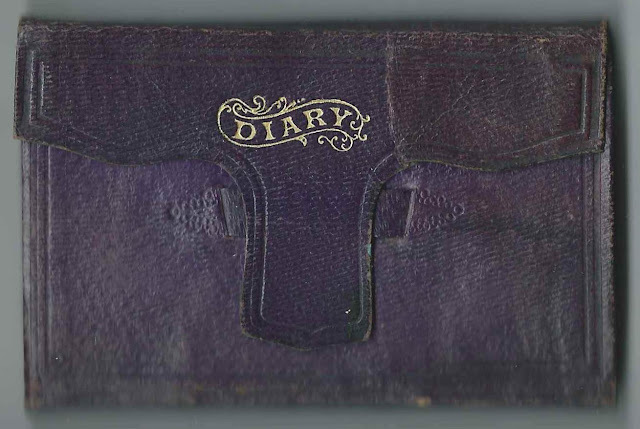 James would die in December of 1873; Ida mentioned his death and burial. 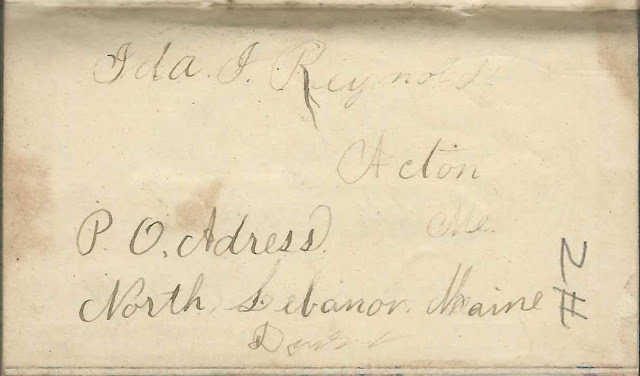 Mr. Daniel Jones, Esq., presumably of the Milton, New Hampshire, area. please leave a comment or contact me directly.